Timepiece is a bold, near-gothic face with heavy gear and needle elements in the upper-case letters. 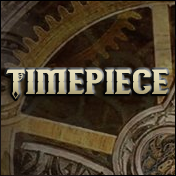 This piece is designed specifically for steampunk-style projects! Includes full alphabet, extended punctuation, Euro, and other characters. Includes both regular and italic faces. This entry was posted on June 14, 2016 by Jaynz.